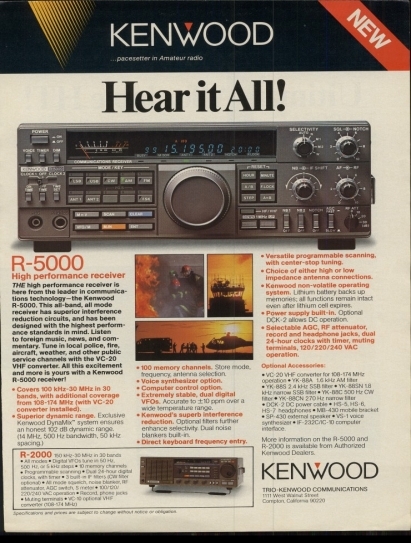 The Kenwood R-5000 looks nearly identical to the Kenwood TS-440. The R-5000 offers an exceptional array of advanced features coupled with high performance. 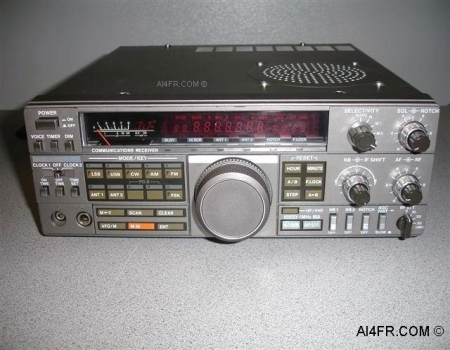 This is simply a fantastic shortwave receiver that is compact, but yet very well laid out and a worthy successor to the popular Kenwood R-2000. This is an all band, all mode receiver that has superior interference reduction circuits and has been designed with the highest performance standards in mind. Kenwood's Dynamix system ensures an honest 102 dB dynamic range when measured at 14 MHz using a 500 Hz bandwidth filter and 50 kHz spacing. The dual digital VFOs are accurate to ±10 PPM insuring exceptional stability. The frequency display is a blue phosphorous with a digital readout down to 10 Hz. 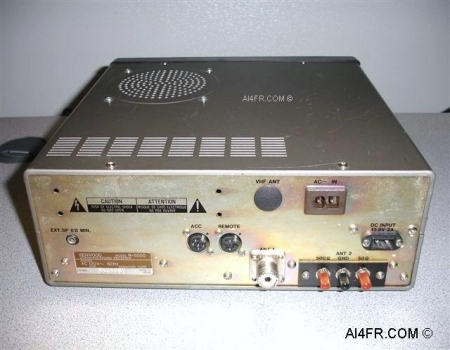 This receiver has 100 memory channels which store the frequency, mode and antenna selection. The R-5000 employs a memory and frequency scanning with center stop tuning. Frequencies are stored via direct keypad entry or VFO. Another excellent feature is that this receiver has a digital 24 hour clock and timer. Other controls include: Squelch, Notch, IF shift. dual noise blankers, auto or manual filter selection, selectable AGC and RF attenuator. 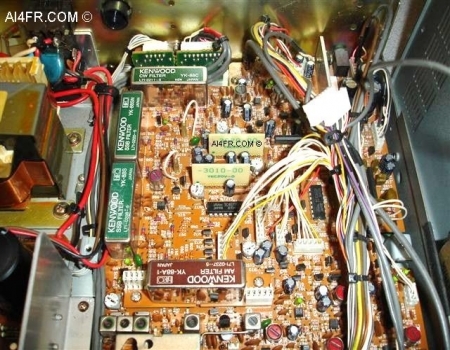 The rear panel has inputs for both coaxial or ladder line antennas. 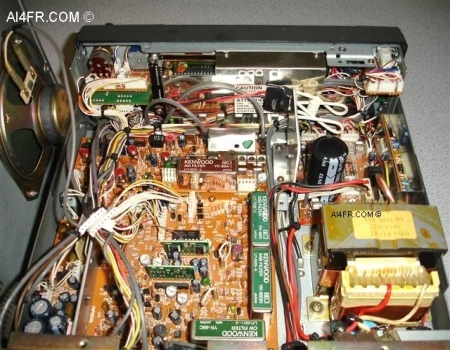 The Kenwood R-5000 has a built in power supply that is run from 120 VAC or 13.8 VDC. Click above for full page ad. These next two photographs show the top cover removed from the R-5000. The photograph on the right is a close up of the filter line-up. In this receiver, all possible filters have been installed. The only optional accessory this receiver is missing from being maxed out is the Kenwood VC-20 VHF converter which will allow for extended coverage from 108 through 174 MHz in all modes.